Hello Doodlebugs! 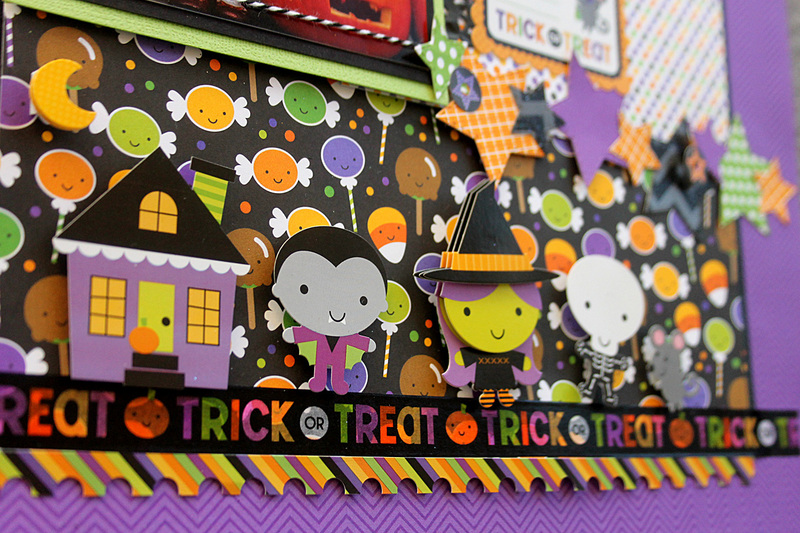 It's Mendi here today with a colorful layout using Doodlebug's new Ghouls & Goodies Collection! I'm always looking for fun ways to incorporate all my favorite patterned papers and with this collection there were many so I decided to create a patchwork border of sorts to show them off and house several of the darling Doodle-pops. Since my squares were all 1.5" I decided to use mostly prints from the 6x6 pad which was perfect for this! I was excited to use the new alphabet chippers and doily for my title too! To add a little detail, I filled each circle with one of darling boutique buttons popped up with foam tape and tied with thread. I finished off my "journaling" block with a sticker from the This & That sticker sheet and one of the fun new paper clips tied with a twine bow. Hi everyone! Candace from Scrappin' 2 Little Princesses here to share a project today! Halloween is coming!!! Yippee!! 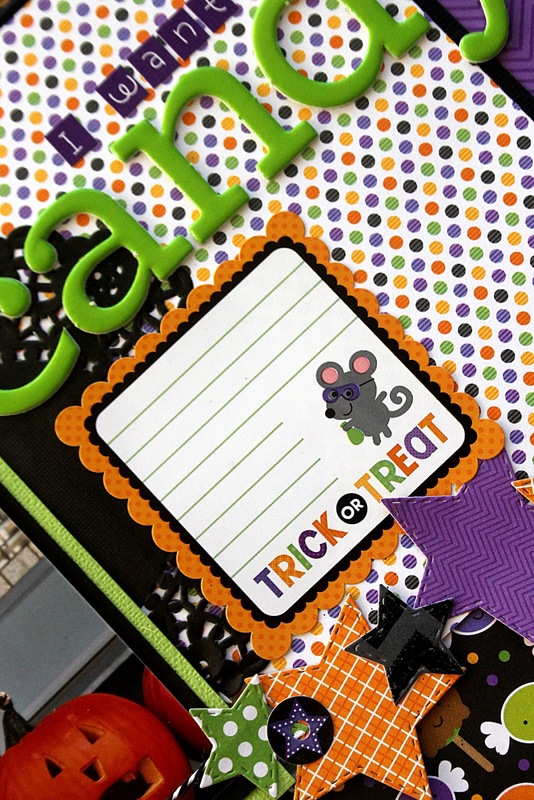 I'm not the biggest fan of the holiday, but I LOVE to make Halloween projects and layouts! My girls always want to be princesses so cross your fingers for me that this year I will have a cute little witch or goblin! This year's Halloween collection is so super cute!! 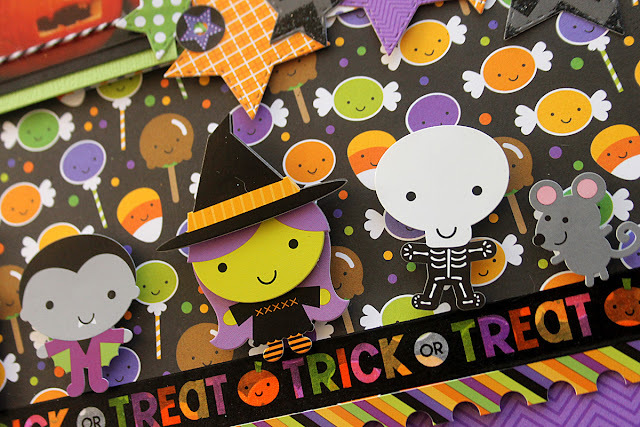 The Ghouls & Goodies collection has all the amazing stickers, patterned papers, Doodlepops, etc that all the great Doodlebug collections also have PLUS there are new products released recently that come in colors to coordinate with the collection. As soon as I saw the new cute little character stickers and Doodlepops I knew I had to make a spooky little parade with them. Aren't they adorable?? I popped them all up with foam stickers to make them stand out. 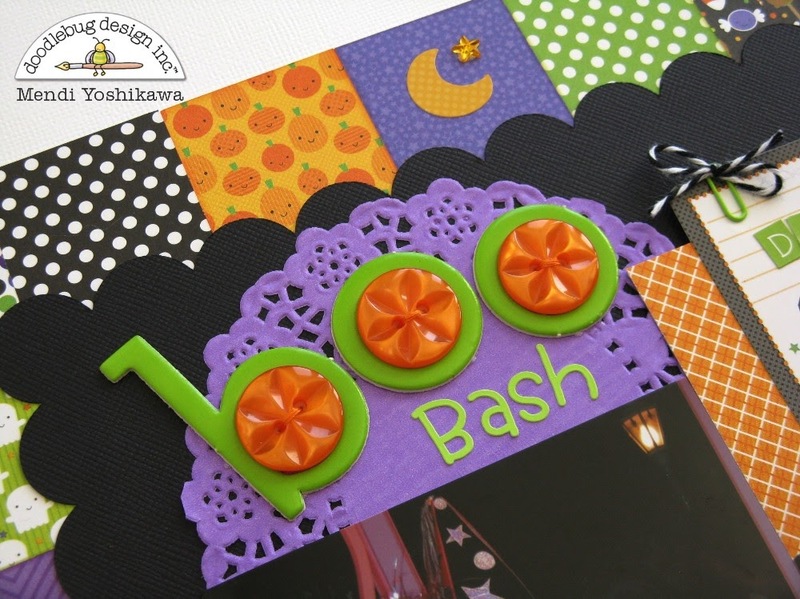 Two of my FAV new Doodlebug products are the Chippers and the doilies in every Doodlebug color. I love how big the Chippers are and they stand our so well on layouts and the doilies are the perfect accent on every project. The Chippers are chipboard alphabet stickers which means they are already sticky on the back, making them so convenient and easy to use. I used random patterned papers from the matching 6x6 paper pad from this collection as well as some star dies to make my own little star border. I hope you were inspired by the amazingly spooky and sweet Ghouls & Goodies collection!! I pinned these fun and fantastic layouts! These are both adorable Mendi & Candace!!! 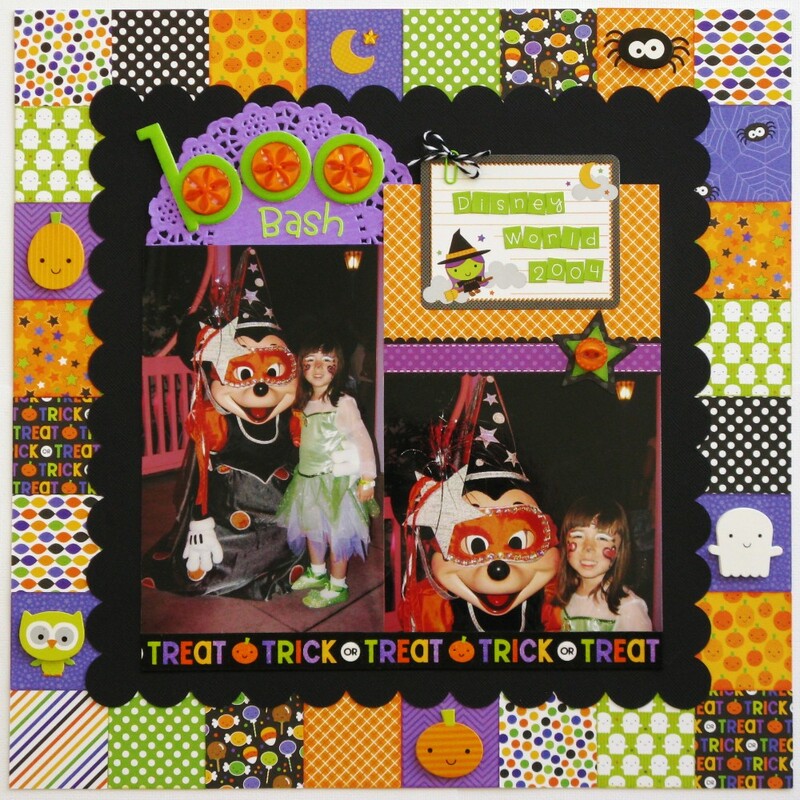 Fantastic Halloween layouts!!!! 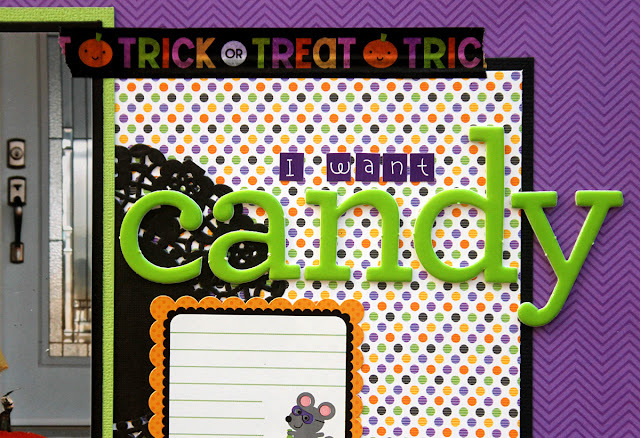 I pinned the I Want Candy one! Love the title and dimension! Doodlebug, as always, just makes me happy! I love both layouts! I like how the buttons on Mendi's layout look just like candy, I aslo like how neat the washi tape looks on Candace layout! The pictures in both layouts are adorable!!! Adorable layouts! I love this color scheme! These are both so fabulous. Can't wait to get this collection. both are totally sweet layouts! Mendi's is so fun with all the different patterned paper squares to create the "frame" and Candace's little monsters along the bottom are the cutest! 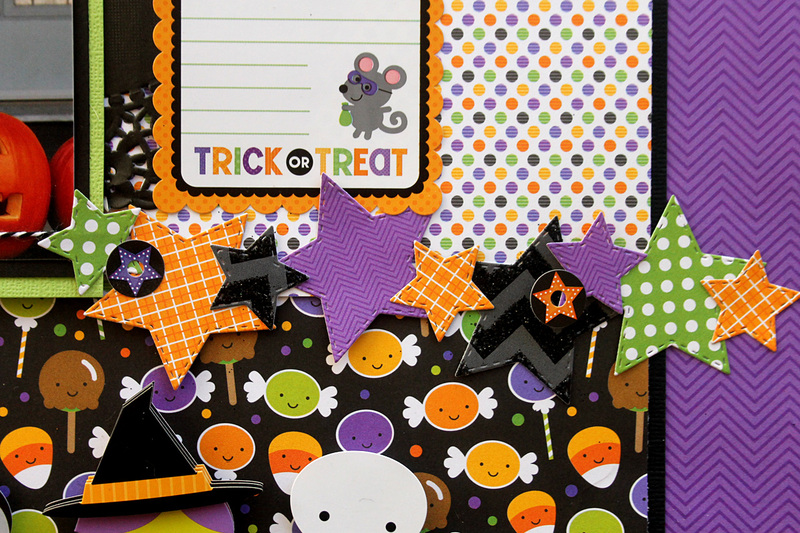 Love them both, tfs more spooktacular Doodlebug inspiration! What fun layouts! I love all of the details and layering. Love the layouts!!! How fun is this collection! Both of the layouts looks awesome, love the little ghouls on each of their projects! Also, the doilies looks amazing! Great layout! I pinned it! I am so super impressed with both of these layouts - they are superbly done and they showcase the Doodlebug new collection perfectly!! What awesome, incredible and ingenius ways they have used to make these cool layouts!! !